I don’t consider myself a materialistic person, but I do struggle to let go of really pretty and useful items. I recently read this book and managed to discard (donate) some old handbags. However, I absolutely couldn’t let go of my Cambridge Satchel Company bags as I consider them life long belongings, so I thought I would share them with you today. (Apologies to anyone who is vegan, feel free to skip this post). The first satchel I ever received was this 15″ classic red batchel as a gift from colleagues when I left my last day job. I use it daily as my ‘work’ bag and love how the leather has become a little worn. It has my initials embossed on the front and regularly gets thrown in my bike basket when I’m cycling around Cambridge. This summer I took photos for a friend’s wedding and they gave me a satchel as a thank you gift – they know me well! This cream 11″ satchel has been my go to bag for coffee dates with G.
I got free embossing on this one at the Cambridge store (they run offers from time to time), so opted for a gold bicycle and my initials to match the gold hard ware. My blue twist lock shoulder bag in blue is the only Cambridge Satchel I have purchased myself. This one was originally £240 and reduced to £120. I waited as long as I possibly could and got it for £70 just before the sale ended! It has a tiny bicycle on the twist lock and also on the studs too. I really like the shoulder bag, but now I’m looking at the new tote range and coveting one of those…..5 is too many right? This 11″ mint satchel was a gift from G and my family for my 30th a couple of years ago. I got it at the same time as some mint converse sneakers – I love a bit of matchy matchy. Predictably, I went for bicycle embossing again, but this time in silver to match the buckles. Sometimes when I am cycling through the city, I spot the Cambridge Satchel Company car that the owner Julie Deane drives. I often follow along with the story behind Cambridge Satchel Company and I admire Julie for acknowledging how much fashion bloggers helped her brand grow after she started with a budget of just £600. They are releasing endless lines each month (hello cloud bag!) and are proud of using UK manufacturers. The Department for Business, Innovation and Skills are currently working with Julie Deane to undertake an independent review of self employment in the UK. If you’re interested, you can take the survey here (closes 8 November 2015). I’ll be interested to see what comes of it. Thanks for letting me share today. It’s not often I’ll buy into a brand with such loyalty, but it just goes to show, sharing your story and business journey can really be a great way to connect and drive things forward. I’m definitely inspired and proud to call the place where it all started my home. Pastel tones will always be a favourite of mine. I’ve been lusting over Spring/Summer fashion and home wares in pale blue, light pink and minty green. I’m not generally a materialistic person, but it sure is fun to collate wish lists of things that have caught my eye. ESPECIALLY the new Le Creuset Bloom Collection, gosh it’s pretty. In our kitchen we have the Teal range which I adore, but I would definitely consider mixing it up a bit for the new colours. My Cambridge Satchel Company wish list is growing too. They just keep releasing such lovely new lines! I was so chuffed to get this shoulder bag in the sale, it was an absolute bargain. Thanks for letting me indulge and share my wish list with you today! Cambridge Satchel Company – Cambridge Store Opens! I’ve had a fairly quiet weekend following a mental couple of weeks at work, so G and I headed to town yesterday to have our usual coffee date and a mooch around. Decaf for me of course. Whilst in town I could feel myself being drawn to the colourful goodness of the Cambridge Satchel Company Store which opened on Rose Crescent on Saturday! To say I was a wee bit excited was an understatement. It was glorious. For the opening they had neon bicycle cupcakes to match the satchels of course, and champagne and chocolates aplenty. We avoided these for the sake of weight watchers points and had a lovely chat with the embossing guy as he personalised two newly purchased satchels. I swooned over the Chelsea Collection for a good while, especially the beautiful mint one. G made a mental note and mentioned birthdays etc……it’s the big 3-0 this year so maybe a minty satchel could be mine *dreams*. The shop is light and fresh and stocks a whole range of colours including my classic red batchel. Staff were friendly and welcoming. G and I talked about the Cambridge Satchel Company journey and how it went from small business to huge business. If you’re not aware of the story, check out this video – inspiring stuff. It’s great to see how bloggers have played a part in the success of the company. We did some more shopping in Molton Brown and then headed home for email catch ups and tidying. I’m loving having a desk now in my new craft room which displays these beautiful Protea I got from my work colleagues. 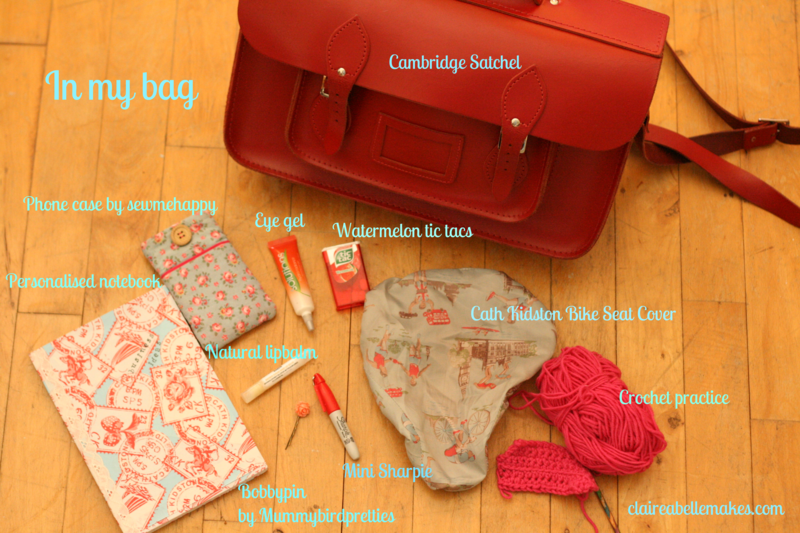 Here are the items I carry around in my beloved Cambridge Satchel bag….. Eye gel. I seriously need this stuff for the dreaded dark circles. Watermelon tic tacs. These things taste amazing. Personalised notebook. I have about 4 different notebooks on the go at once as well as the Evernote app, which always gets neglected for handwritten lists. Natural lipbalm. A friend sent me this handmade lip balm from Canada and I loved it so much I ordered about 10 more. This one is dulce latte flavour mmm. Bobbypin by Mummybirdpretties kindly sent to me in a set from Claire, a fellow Cambridge maker. Mini Sharpie. I love a Sharpie. Cath Kidston bike seat cover. This is a must in the UK where it never stops raining & I only get around on my dutch bike. Crochet Practice. My next crochet course is Granny Squares so I always try to get a bit of practice in when I can. There were also loose coins, random notes about my prescription, work notebooks, anti-bac hand gel and other equally boring things! What do you carry in your bag?